3745 ⊙ 239 2 Fr. 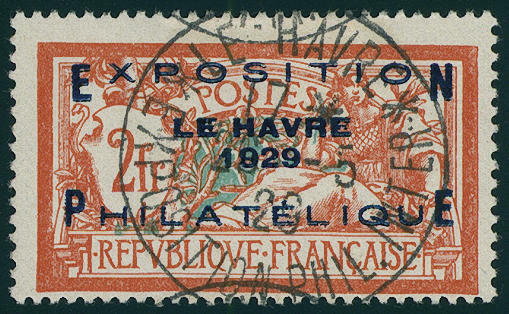 Exhibition Le Havre 1929, with very nice centered appropriate exhibition cancel, fresh colors and very well perforated in perfect condition. Michel 600,- €. 3748 252/54 National debts redemption fund 1930, fresh colors and in perfect condition mint never hinged Michel 250,- €. 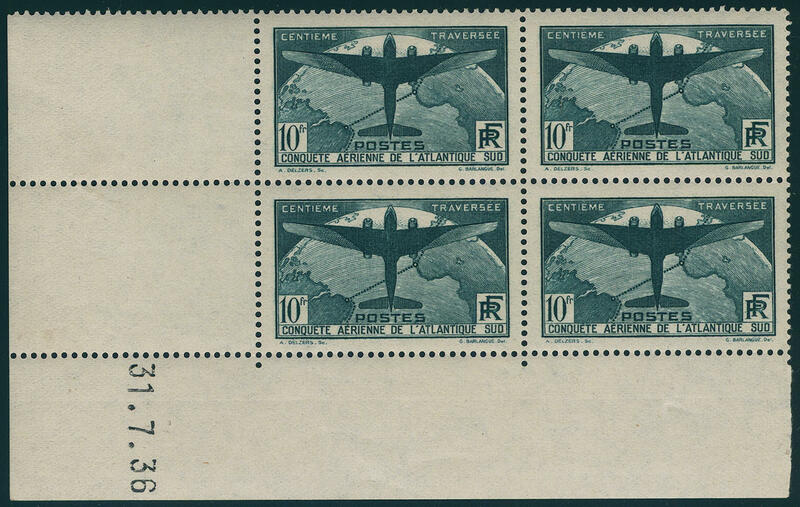 3749 305/11 Airmail set 1936, fresh colors and in perfect condition unused. Maury 1180,- €. 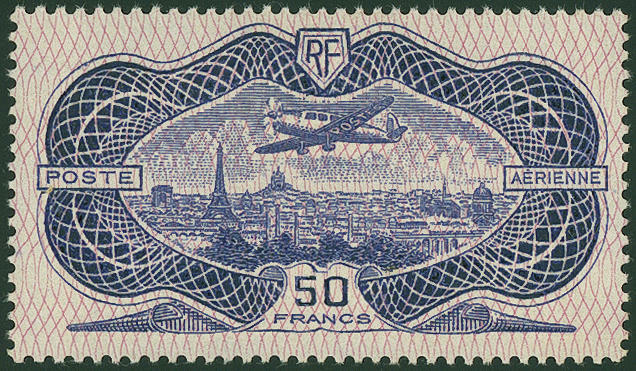 3750 321 50 Fr. 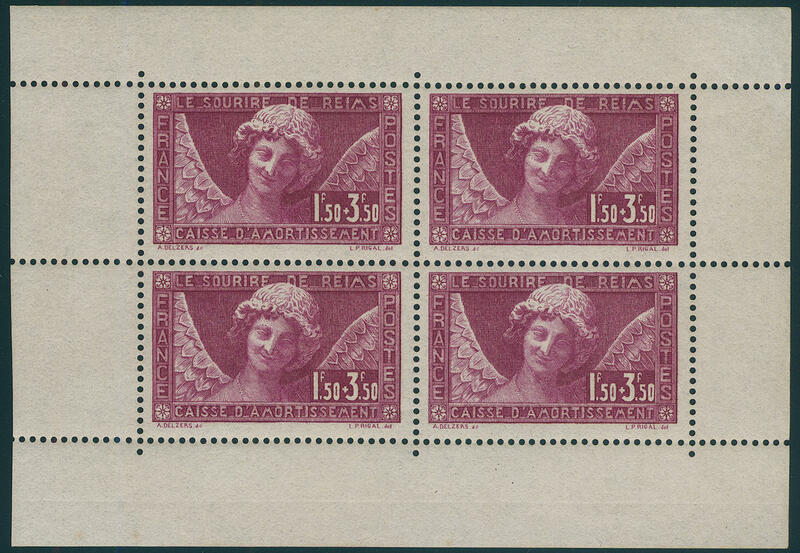 Bill 1936 block of four from of the right lower corner of the sheet with date of printing \"15. 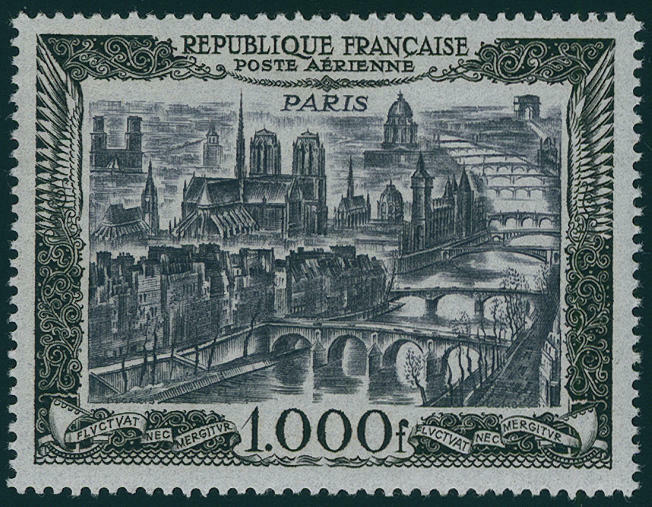 JUIN 1936\", fresh colors, unfolded and in perfect condition mint never hinged a very decorative and scarce unit! Maury catalogue 8700,- €. 3751 321 50 Fr. Airmail 1936, fresh colors and very well perforated, in perfect condition mint never hinged, without any signs, utterly perfect condition. 3752 321 50 Fr. 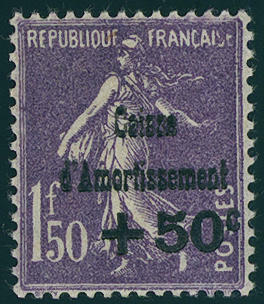 Bill 1936, fresh colors and very well perforated, in perfect condition mint never hinged, without any signs. Michel 1100,- €. 3753 321 50 Fr. 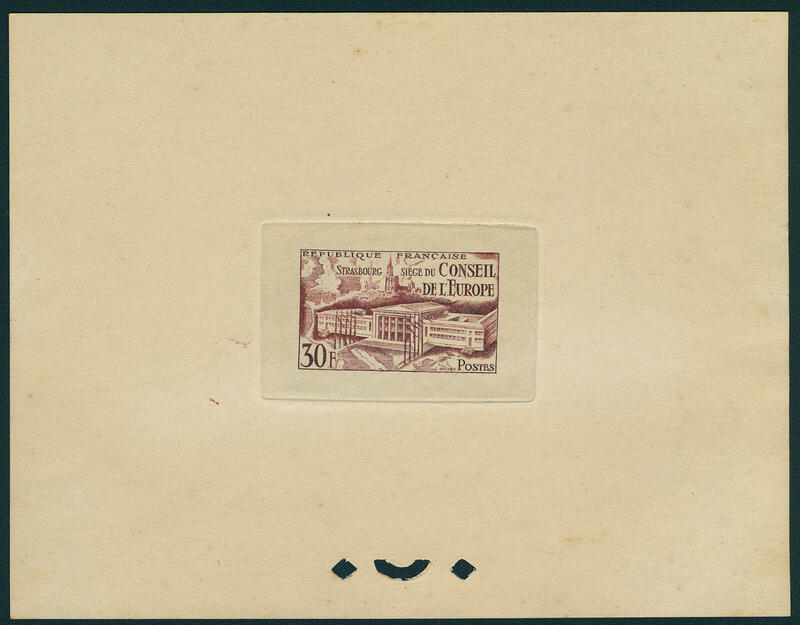 Airmail 1936 from lower margin, fresh colors and very well perforated, unfolded and in perfect condition mint never hinged photo expertize copy for former block of four von der Weid. Michel 1100,- €. 3754 321 50 Fr. 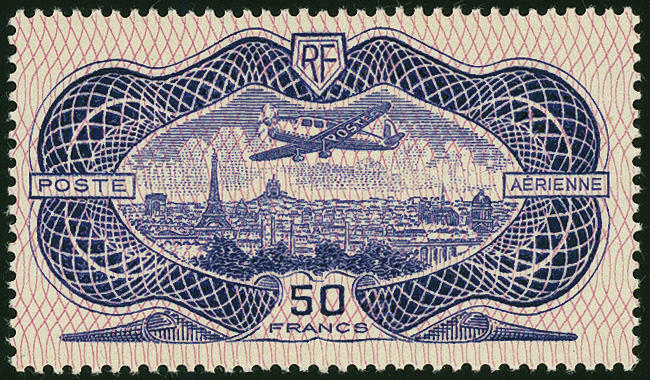 Airmail 1936, fresh colors and very well perforated, in perfect condition mint never hinged without any signs. Michel 1100,- €. 3755 321 50 Fr. Bill, fresh colors and in perfect condition unused. Maury 800,- €. 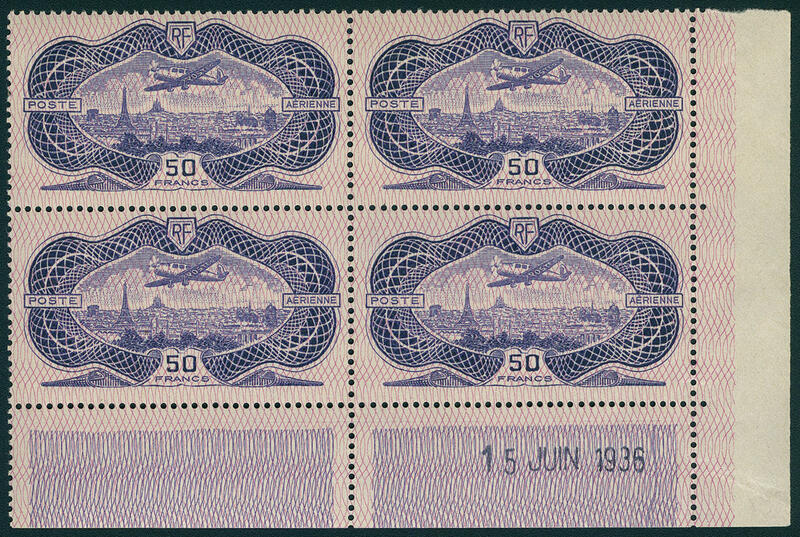 3756 326/27 Atlantic flight 1936, block of four set from the corner of the sheet, fresh colors and very well perforated, unfolded, with dates of printing \"4.8.36. 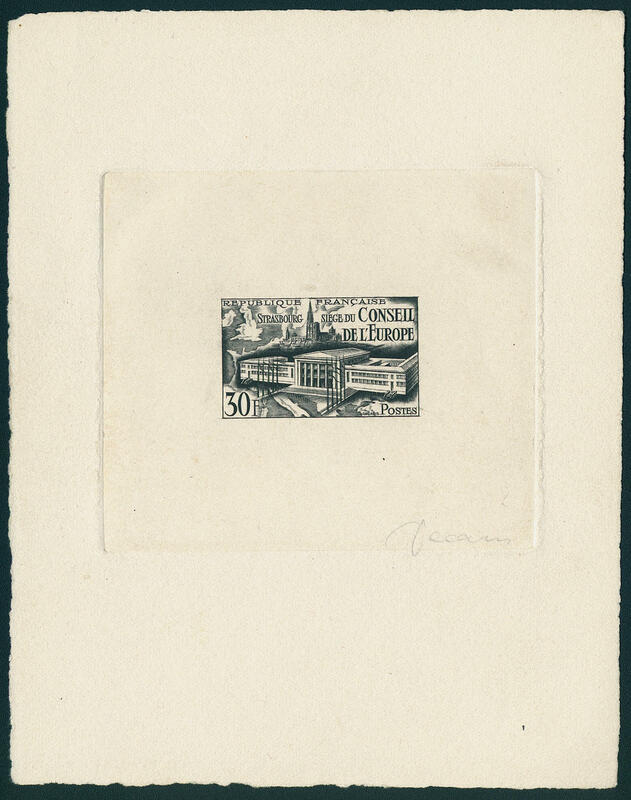 \" respectively \"31.7.36. \" in perfect condition mint never hinged, without any signs. A very nice and scarce set! Maury catalogue 4000,- €. 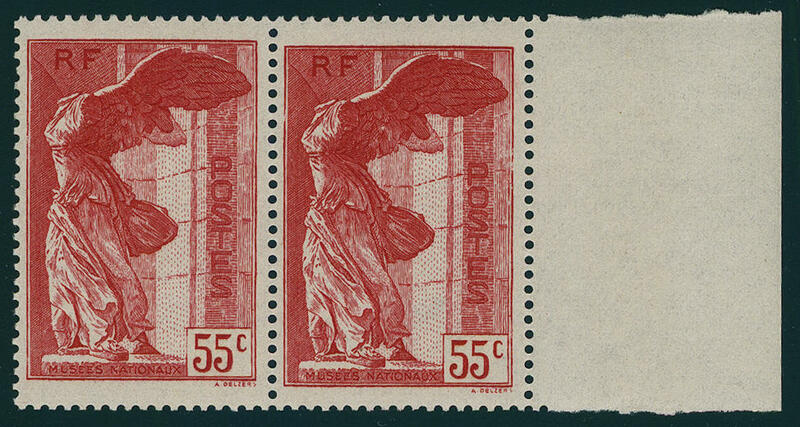 3757 349/60 Louvre 1937 in horizontal pairs from right margin, in perfect condition mint never hinged, without signs. Michel 560,- €. 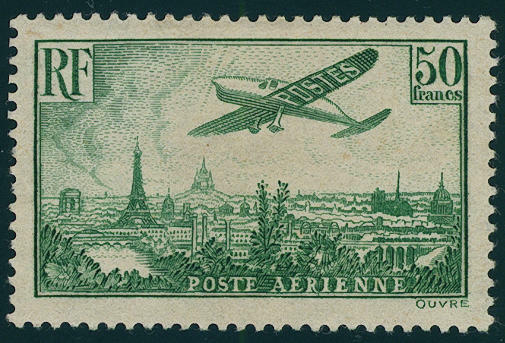 3758 861/65 Airmail 1949, in perfect condition mint never hinged Michel 230,- €. 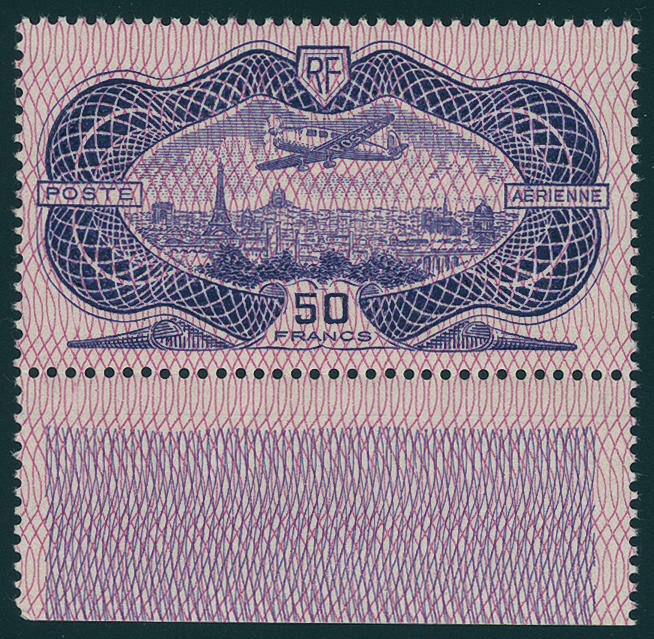 3759 Fheetlet 942 30 Fr. Council of Europe 1952, very rare Artist block in black with signatur of the designer \"DECARIS\" in perfect condition. Very small edition! Maury 1400,- €. 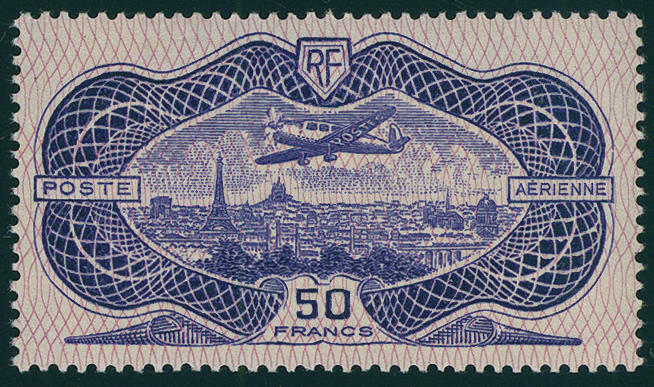 3760 942 30 Fr. 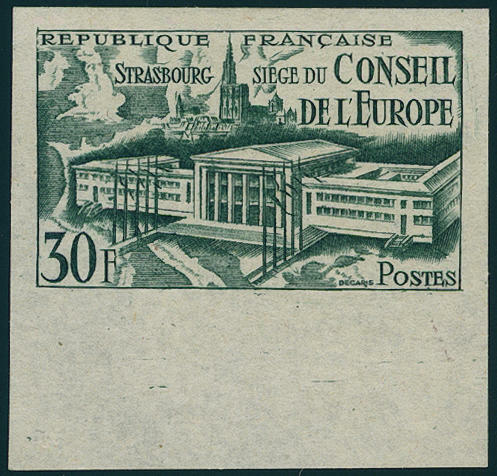 Council of Europe 1952, proof in Secretary of State souvenir sheet form in different colour blackish red, a little shaded. Very rare! 3761 942U 30 Fr. Council of Europe four sides unperforated from lower margin, in perfect condition mint never hinged Maury 750,- €. 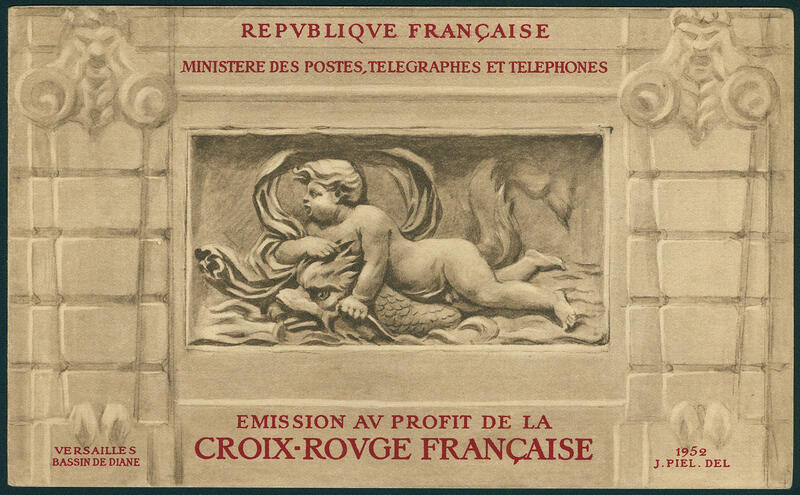 3762 956MH Red cross stamp booklet 1952, in perfect condition mint never hinged Michel 400,- €. 3763 956MH Red cross stamp booklet 1952, in perfect condition mint never hinged Michel 400,- €. 3764 989/90 500 and 1000 Fr. 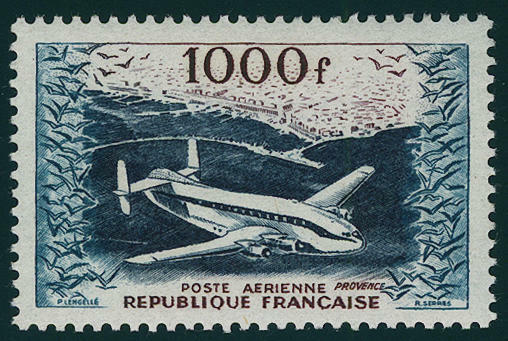 Airmail 1954, in perfect condition mint never hinged Michel 280,- €. 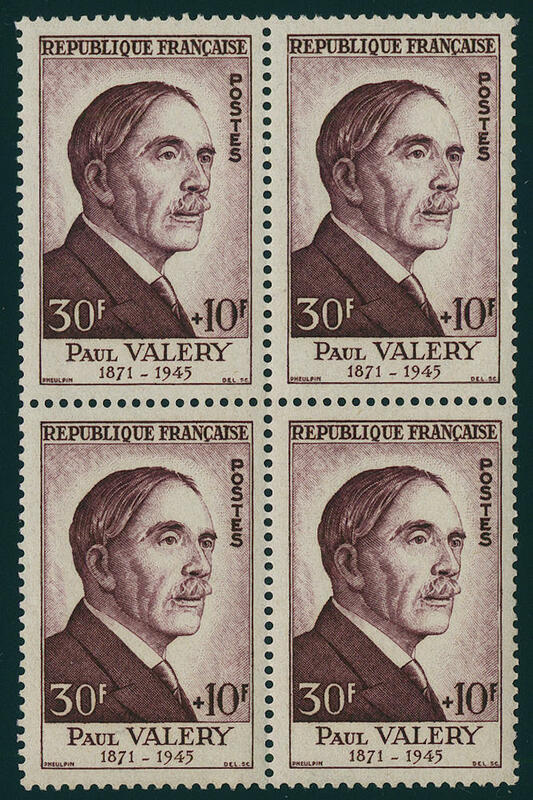 3765 1015/20 Famous French peoples 1954, wonderful block of four set, unfolded and in perfect condition mint never hinged Michel 520,- €.